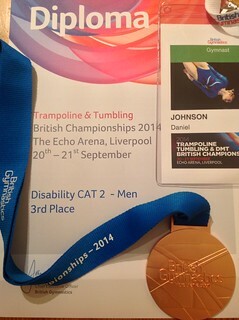 The Echo Arena in Liverpool hosted the 2014 Trampoline, Tumbling and Double-Mini Trampoline (DMT) British Championships, which saw an exciting and thrilling weekend with competitors from around the country competing for the British titles. Following his success in previous events throughout the year, Dan had qualified to compete in the Final of the Mens National A Category 2 section. In a tight and closely-fought contest between himself, Nathan and Jago, Dan held his nerve to successfully complete his most difficult routine to date. He achieved 3rd place in the end, beaten to 2nd place by just 0.6. A great testament to the effort and hard-work put in, and a terrific achievement for Dan, who collected his medal amongst the lights and laser displays that greeted the crowd at the arena. Well done to Dan for this fantastic result, and to all of the other competitors and coaches.